July 17, 2011 by G.
I am such an iced coffee fan. I was just stalking your blog the other day wondering when you were going to post again. 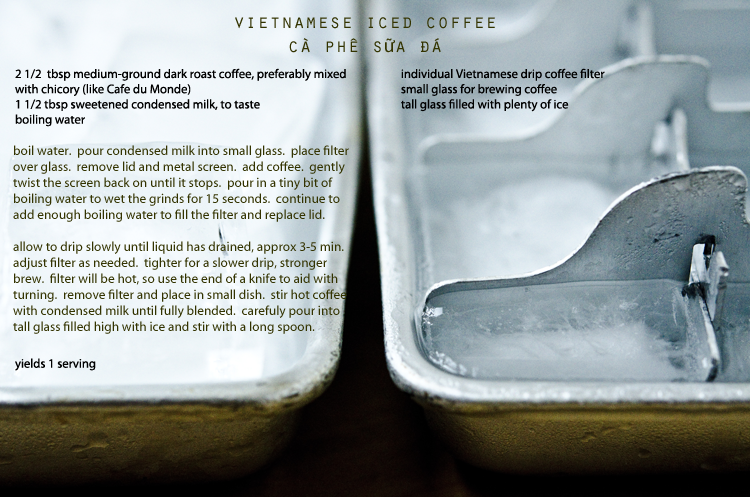 :] Vietnamese iced coffee is one of my favorite guilty pleasures. I love every single thing about this post…you’re dripping coffee pics are amazing! I am a big fan of Thai Iced Coffee and this seems very similar? I can’t wait to make some! oh g. everything about this is good. Lovely, lovely, lovely. I just bought some vintage ice cube trays from Etsy just like yours. We love the thick cubes they make. What a gorgeous entry, and stunning photographs. Being able to imagine one’s parents so young & in love is a blessing; you’ve captured that feeling perfectly. I’m moving to Hong Kong soon. And this post just made me SO excited about trips to Vietnam! Coffee never looked so glamourous. The animation totally tripped my out. Beautiful as always! This is absolutely stunning. The words, the stories, the photos all give such a beautiful, intimate portrait of your family and your roots. This coffee brings me right back to me travels in Vietnam last year. There really is nothing quite like it. The caffeine and sugar hit me like a freight train! I remember the first time wondering if someone had slipped something else in there! Your photos are devine! Just beautiful! One of my favorite ways to drink coffee! Lovely pictures! This post is really a work of art! Simply beautifully written! My son was born in Rome and I know he’ll have “memories” of that time even though we moved before he was old enough to remember it, through our stories and photos. Your photos are really incredible. Lovely post-it makes me thirsty, too! We have a Vietnamese Bakery in St. Paul, MN. and they serve Vietnamese coffee there. It’s always a treat to go there. Such a wonderful post. To me, this is what good food writing is about. Beautiful images, too. Lovely story, thanks for sharing. This looks like the perfect coffee, and your photos are stunning! on July 18, 2011 at 11:50 am | Reply Stephanie R.
what a delicious post! the photos….wow. as much as i love talking about sweets, i love talking about childhood memories even more. looking at photos and hearing my parents tell stories from way back when. your writing above had me grinning with you. i could practically hear your parents’ giggling in my head – and the clanking of the ice cubes too. i love this post. and if i drank coffee, i’m sure this is how i would want it. ;) oh, and very cool brewing effect above. 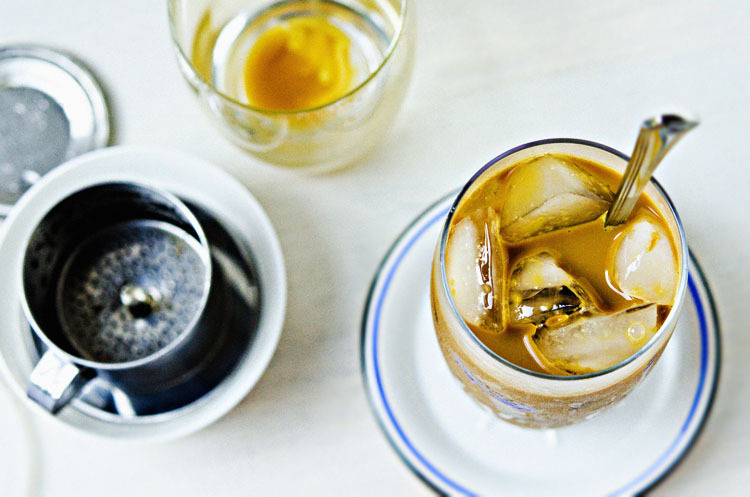 vietnamese iced coffee is my favorite kind of iced coffee! when my husband and i honeymooned in vietnam a few months ago we would have several of these a day – i swear the condensed milk is addictive! thanks for reminding me about this yummy summer drink, ill have to make it again soon at home even though it isnt very summery in london right now! a stunning post. i quite love vietnamese coffee. in college i had a filter set like this and bought special coffee online so i could have the chicory coffee! O gosh i love this stuff, Cafe du Monde is… like crack! The photos! Oh, I can’t get enough of the photos and the writing, G! Just so great. As for the coffee- I am not big on the stuff, but I have a feeling I may be a convert after a cup of this! i love this post more than words can describe. the photos are a visual feast. and now on my list of things to get.. a vietnamese coffee maker. thank you SO much for sharing this. And can you share a bit or a link on how to do the moving pictures? just so good.. all of it. I love this story. I’ve seen so much about Vietnamese Iced Coffee recently but this is the first to make me HAVE to try it. Beautiful, Beautiful, Beautiful–as usual! i have wondered how to make this fine sip FOREVER. i can see i was missing the proper equipment. and coffee. duly noted. any chance it would work with a melitta or other filter system?? i am pretty much certain i need this to beat the heat, right now. on July 21, 2011 at 7:32 pm | Reply cathy x. x.
Oh I love this stuff! I recently found an instant version at a local restaurant. Are those any good? on July 24, 2011 at 10:24 pm | Reply G.
Hi everyone! Thanks again for such wonderful comments and hope you’re all beating the heat. Wokintime, I’d personally stay away from the instant version. Thanks! I thought so. It was tempting though I guess good things require patience. on July 25, 2011 at 3:57 pm | Reply G.
I have had Vietnamese hot coffee and even had a nice lady from the country teach me how to make it. However I have never had it iced, this looks like a nice treat! delish. great blog. excellent title. Thank you for another stunning post. I just love the animated photo, great post! This is just such a beautiful story- I love that you can see the love between your parents. You’ll have to find out exactly how they did become engaged …. Completed mesmerized by your stunning photos. 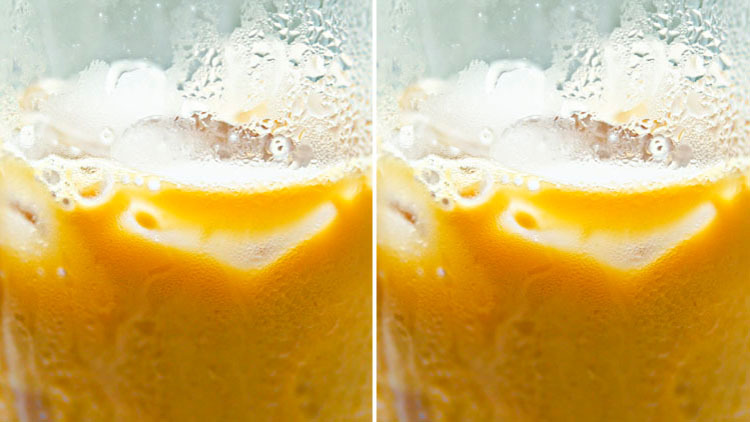 In the Caribbean we use condensed milk in coffee too – that’s how i grew up drinking it. Guess what?? We were mentioned in the same post together!! http://live.gourmet.com/2011/07/weekly-roundup-breakfast-bites/ Pretty exciting. :) The coffee photo with movement is absolute perfection. Love the music pairing as well. Your photos are amazing and the story that accompanies them is wonderfully nostalgic. :) Thank you! Very very nice post. I love the story you tell, as it gives the recipe a life around. You tell like a friend who’s talking of his childhood days – in fact, remembering me a bit of Marcel Proust, like this very much. I love Vietnamese iced coffee. This has given me such a strong craving. Great story! Wonderful foodie memories, and beautiful accompanying photos… as usual. It’s that first sip of coffee, when the whole world seems to recalibrate. as always, great photography that accompanies a story I could read over and over. cheers! wow- great post. you are a fantastic writer. the photos are amazing as well! What incredible style in these shots. Love. 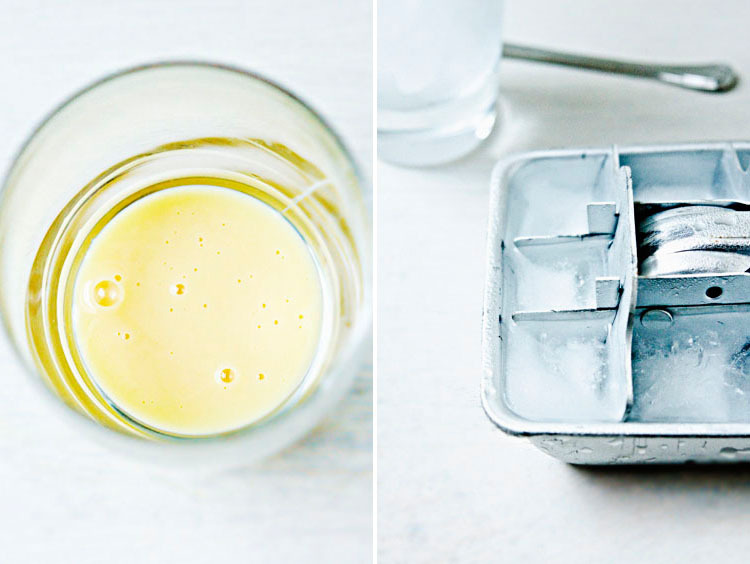 ummmm, I LOVE those photos :) that looks delish and refreshing. Totally want that right now! ahh tempter! there really is nothing better! it is almost like a milkshake so rich and delicious! thanks for sharing this recipe! I wonder if one can find a substitute for a vietnamese coffee brewer. it’s really hard to find one here in the philippines. i brought mine home from vietnam. it really is different from the usual home brewing!!! After reading your Freshly Pressed post about market day and this post about coffee, I’m hooked! You write very well and the photos are just amazing. 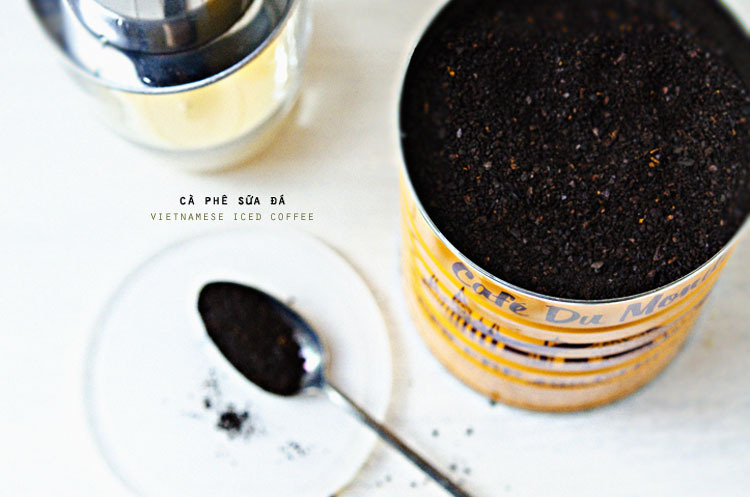 Hi I just randomly bumped into your blog and it is so nice to know that you are Vietnamese born :) Cafe sữa đá should be Vietnamese iced white coffee I guess??? (I thought u missed out the “white” part) Anyway it’s such a great thing from our home country. But it’s a little bit too sweet, don’t you think so? Btw, your photos look really nice! What are your favorite Vietnamese restaurants in Uptown? I just moved to the area and tried one tonight which was ok but I have a feeling there is better. Keep up the great work, your photos are absolutely stunning. This is my FAVORITE coffee drink! My husband is Vietnamese and is family always makes Ca Phe Sua Da when we come over! Mmmmm! Pretty photos! What kind of camera/photo editing software do you use? I love Vietnamese coffee. Best I have had so far was at cafe dulce in L.A. Going to have to try this at home. Thanks for sharing. I love iced cofee. and these pictures…! great! Iced coffee is one of my all time favourites, especially in the summer. I can’t wait to try your suggestion! The pictures are fantastic and the iced coffe looks incredible! Great idea with that GIF, now your picutres are alive!